The Organic Elements Collection Elite Natural Latex & Coil mattress was designed and handcrafted with the health and Eco-conscious person in mind – by building a mattress with as many natural, sustainable and organic elements as we could source. This mattress is built without dangerous chemicals or toxic substances in order to give yourself and/or your family a much healthier and safer sleeping environment! Certified G.O.T.S. (Global Organic Textile Standard) Organic Cotton Fibers. 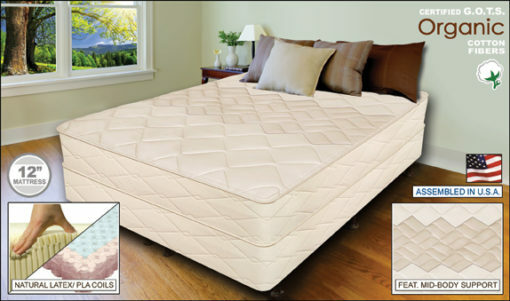 Quilted Natural Latex In Top Cover. Natural Latex Features A Sleep Cool Pin Core Air Flow Design. 8″ (884 Count) Upcycled Steel Coils Are Pocketed In PLA Plant Based – Sugar Cane Derived Fiber Encasements. Needle Punch Certified 100% American Wool Bottom Barrier For Coil Protection. Fully Assembled Foundation. Premium All Wood Construction. King Size Are Split For Additional Strength, Stability and Convenience When Moving.